The Circleville Earthworks were constructed by the Hopewell culture (100 B.C. to 500 A.D.) -- an archaeological designation indicating a cultural moment for pre-contact American Indian people living in the region of what is now Circleville, Ohio. The circular earthwork consisted of an outer circular wall 1,140 feet in diameter and an inner circular wall with a ditch between them. This double-circle was connected to a square enclosure 908 feet long on each side. In 1820, the walls were five to six feet in height and the ditch was around 15 feet deep. The square had eight openings and each opening was partially blocked by a mound. These mounds were about 40 feet in diameter and four feet in height. At the center of the concentric circles there was a mound, which was about 15 feet in height and about 60 feet in diameter. When excavated, this mound was found to contain a number of burials and artifacts. Originally, local residents began building the community of Circleville in 1810 around the large circles. They built the county courthouse on the site of the large central mound and Circle Street surrounded the earthworks. 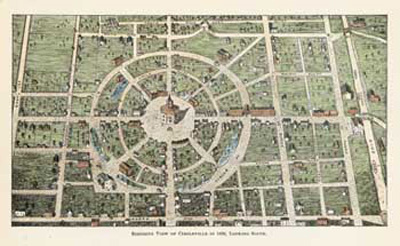 Beginning in 1837, however, Circleville "squared its circle". It removed the circular street along with the last vestiges of the ancient earthworks. Today, the city's name preserves the memory of the ancient Hopewell culture.